A film on Mandalay and its less visited sights beckons all to picturesque surroundings. A letter never serves its purpose unless it is read and to hold on to them for 50 years without being opened? This is the mystery that inspires Pin, the female lead of the movie “From Bangkok to Mandalay” to go on a journey to Myanmar, clutching ten unopened envelopes to unravel her grandmother’s love story. 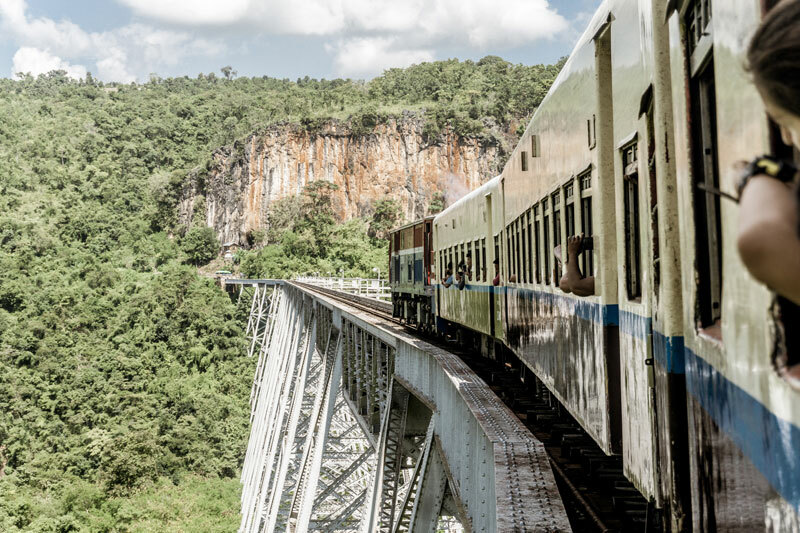 The road trip movie was shot in many stunning and unseen places around Mandalay and nearby towns and after watching it, you might want to grab your backpack and set off on a similar path to such beauty, just like Fah Thai did. Part of my journey follows a grandmother’s last wish in the movie that they get read in the order in the place they were written and posted. The trip begins in Mandalay, the last royal capital before it was annexed by the British Empire. Answers to the letters are gradually uncovered in this well received movie, and marks a first time collaboration between Thailand and Myanmar under the direction of Thai director Chartchai Ketnust. It just hit the screens in Thailand and Myanmar around the end of last year. The movie inspired further spiritual awakening in me, although it began with a rude one when i found myself on the back of motorcycle taxi that came earlier than the appointed time. Making our way through the darkness and empty streets – it took only 5 minutes to reach the destination. My watch showed that it was 3:50 am and while I was wondering maybe it was too early – surprisingly, a crowd of Buddhist devotees were already gathered at the Mahamuni Buddha temple. The daily face washing ritual of the Mahamuni Buddha image, a much revered figure, holds great significance for the people of Mandalay. At around 4:30 am, a senior monk started the ablution. People began praying and offering food and flowers to pay respect while monks and male devotees performed the sacred ritual. Be it my faith or curiosity, it was a true blessing to be a part of this sacred ceremony and to witness the local people’s strong faith in Buddhism. I moved on to a place that survived World War II, to Shwenandaw monastery whose structure is made from teak wood. Also known as the Golden Palace Monastery, it is famed for its beautiful wood carvings too. The building is deteriorating but retains its exquisiteness. 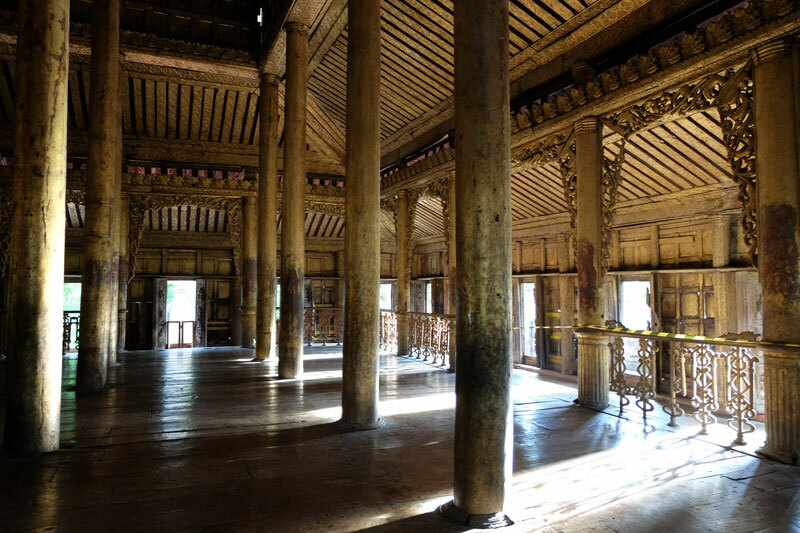 Though it is not as grand as the Mandalay palace,its teak wood simplicity gave a sense of calm and detached me from the noise of tourist groups. The monastery’s distinctive architecture and artistic wood carvings are truly amazing. It was also impressive to see local people praying and meditating in the monastery, making this place even more sacred. I just couldn’t help reminisce about those days when King Mindon spent his last days here.